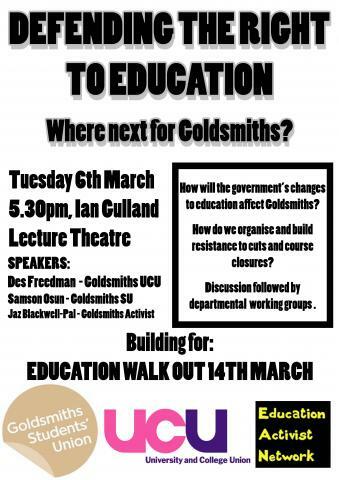 Defending the Right to Education: Where Next for Goldsmiths? An open discussion about the future of Goldsmiths in light of the changes to higher education, how we can organize resistance to cuts and closures on campus, and how to build for the NUS walkout on the 14th March. This meeting has been called jointly by the Students Union, UCU lecturers union and Goldsmiths Education Activist Network. With the warnings we’ve had from London Met., t’s more important than ever that Goldsmiths staff and students come together to discuss how to go forward. NUS president Liam Burns has also called a national week of action starting on the 12th March. This will include a walkout on Wednesday 14th but also events through the week. The aim is to build understanding of and resistance to the government’s plans for higher education. After the discussion we will break off into departmental working groups to co-ordinate with others in our department, both to build for the week and to address issues facing each part of Goldsmiths.